I recently made a stop at the Nat Sherman Townhouse and after finding out that no new shipments had come in since my last visit, I decided to try something from Tatuaje, a brand which I’ve generally overlooked after a handful of less than stellar experiences. The result is what’s up for review today: the Tatuaje Regios Reserva Broadleaf. 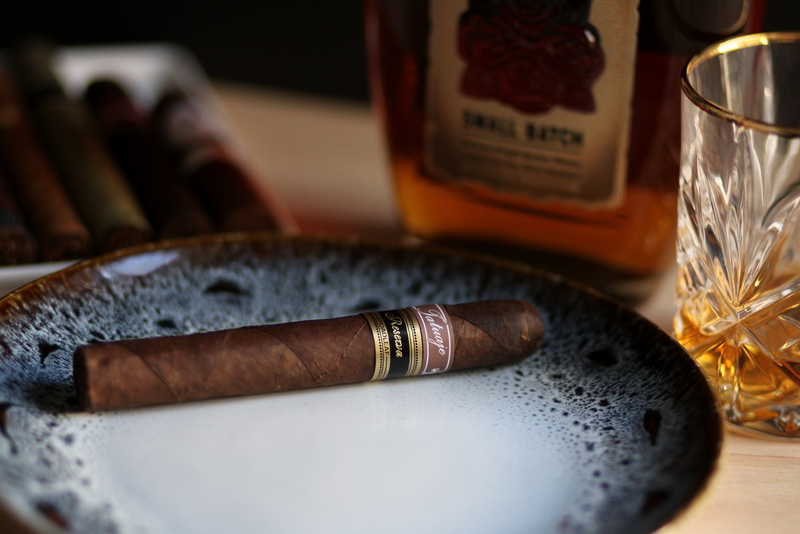 Right off the bat I can tell you that this cigar does deliver some of what you might be accustomed to with a Connecticut Broadleaf wrapper: lots of richness alongside sweet chocolate and coffee notes. But there’s a lot more to this cigar than any typical flavor profile, so let’s get on to the review. The Tatuaje Reserve Broadleaf features a somewhat rough, decently veiny Broadleaf wrapper. Branding on the cigar is your standard Tatuaje labeling with the additional Reserva Broadleaf band. The cigar is slightly springy when squeezed, and this is consistent down the cigar. Off of the foot, I pick up dry wood, some spice, and a slightly berry-influenced coffee. The draw is perfect, just the right amount of restrictiveness. The pre light draw is spicy, with a musty texture and aromas of dry wood. 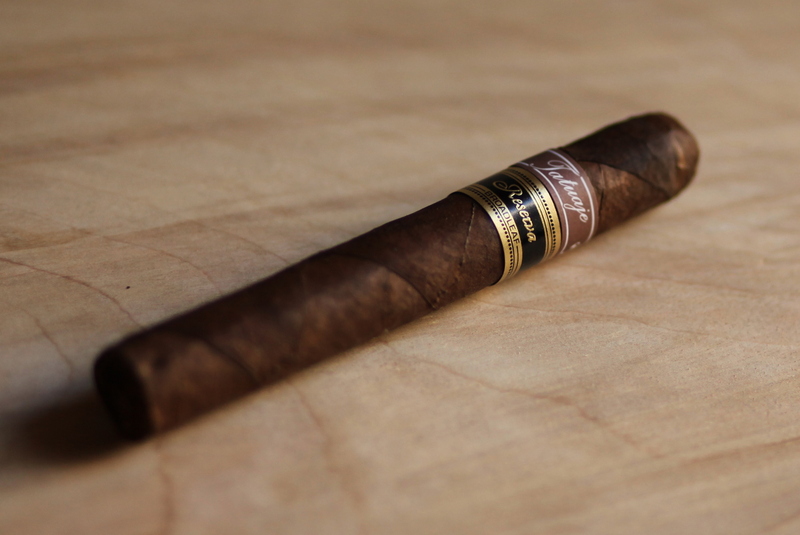 The Tatuaje Reserva Broadleaf opens with rich, slightly textured, medium bodied smoke. Flavors include black coffee, dry leather, snickerdoodle cookies (cinnamon, sugar, some salt), and touches of sweetness and white pepper on the retrohale. Smoke production is solid. Certainly above average. At an inch in, the retrohale is now shifting between white pepper and sea salt dark chocolate. The burn is perfect. At the beginning of the second third, leather is prominent, along with lemon peel and dry wood. The profile is considerably drier than the first third, though strangely the retrohale has settled down considerably. At halfway, the smoke is musty and flavor is down to the lower end of medium. Notes include dry wood, black coffee, and touches of milk chocolate and cinnamon. Enjoyable, but I’m hoping the body and flavor make a comeback. Moving into the final third, the earlier snickerdoodle note has morphed into a graham cracker flavor, and I’m picking up a spicy pickle flavor that works surprisingly well alongside the drier woodsy notes. Unfortunately, the remainder of the cigar (about the last 15 minutes) becomes bland, with dry wood as the only dominant note. The Tatuaje Reserva Broadleaf is an enjoyable cigar, with a decent amount of complexity and a good story to tell. I really enjoyed the interplay between the dry notes (wood, pepper, leather) and the richer notes (chocolate, cinnamon and sugar). At times though, the smoke fell out of balance or became a bit bland. I may not be returning to it soon, but I’d recommend trying it to see if it’s right for you. I’ve never hear anyone let alone a cigar reviewer say they usually pass on Tatuaje. Honestly they’ve become my favorite cigar brand next to Padron, Fuente and Davidoff. Even most Cubans can’t hold its own against most tats. But I guess there’s always that one person. Yeah Joey I hear you. I can tell that Tatuaje’s are quality cigars, they just aren’t generally my flavor profile. I find there is a bit too much of a concentration of leather + dry cedar that, for me, isn’t enjoyable. Preference is certainly important, but it’s impossible to deny that Tatuaje makes cigars that are of higher quality than many, and perhaps most, on the market. Thanks for commenting! Tatuaje cigars are so underrated and overlooked by many. A lot of people don’t even realize that Don Pepin Garcia, one of the best blenders in the world, is behind many of their blends or that many of the blends are rolled at the My Father Factory in Nicaragua. My favorite Tatuaje cigars are Cojonu 2003, Regios, and the J21. All of the broadleaf versions of those three are great as well. They’re all worth a try. I personally find reviewers “nitpick” a little too much. A friend of mine about 10 years ago said no one will remember Tatuaje. Boy was he wrong! One of the great hidden gems in the cigar world.